Home > Children & Reading > Questionnaire: Is Your Child Ready for Chapter Books? When children learn to read on their own it is a momentous event, but it also makes many parents wonder if they should let their children read what comes easily or gently push them towards more difficult options. Knowing when to push your child toward chapter books is one of the most difficult decisions for parents when it comes to encouraging their children’s independent reading. Children become ready to read chapter books at many different ages. We have put together the following questionnaire about this topic. Answer each question, then match your total number of “yes” answers to the explanations at the end. Is your child ready for chapter books? 1. Is your child able to read sentences independently? 2. Is your child interested in listening to you read chapter books? 3. Has your child shown interest in picking up chapter books? 4. Has your child asked to read chapter books from which films were adapted? 5. Have you praised your child for his/her reading and suggested longer books? 6. Has your child wanted to share reading aloud longer books with you? 7. Has your child’s teacher recommended (s)he move along to chapter books? 8. Would your child read along to a chapter book on tape? 9. Has your child expressed a wish to read a book with “no pictures”? 10. 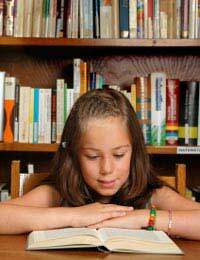 Does your child mimic reading longer books like adults or older siblings? 11. Is your child able to look up vocabulary (s)he doesn’t know while reading? 12. Is your child able to answer reading comprehension questions while reading independently? If you answered “yes” to between zero and four questions then your child may not be ready for chapter books just yet. Spend some time reading with your child and observing how comfortable and fluent (s)he is reading at several different levels. Look at how (s)he deals with difficult vocabulary, longer sentences or paragraphs, and how attentive (s)he is when you read aloud from chapter books. If you feel that (s)he is moving towards reading chapter books, or expressing a strong interest in independently reading chapter books, then look around for some “easy readers” with short chapters with which to start. If you answered “yes” to between five and eight questions then your child may be ready for chapter books. It’s likely that (s)he is just between reading levels: too comfortable with easier, shorter books but still somewhat frustrated by more difficult, longer stories. One way to get around this is to read chapter books together, and to gently introduce longer and more complex books for your child’s independent reading. Your child’s teacher may have more insight into your child’s current reading level and how hard or how far to push him or her, so don’t be afraid to speak with teachers as needed. If you answered “yes” to nine or more questions then your child is most likely ready for chapter books now. Your child seems to cope well with reading materials which are a challenge as well as show an interest in reading books more difficult than his or her current favourites. Don’t push your child to do things for which (s)he is not ready, but follow his or her lead. Very soon, if (s)he hasn’t already, (s)he’ll bring you chapters books at the library or bookshop. Go ahead and get one for your child, but be sure to be available when (s)he reads it to watch how (s)he copes and check comprehension as (s)he goes.